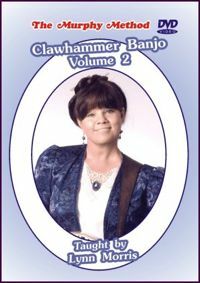 Clawhammer Banjo Volume 2: So, you made it through Clawhammer Volume 1 and you’re looking for more action! Rounder Records artist Lynn Morris comes through again with brilliant teaching as she introduces the intricate double-thumbing technique. These slightly harder arrangements are still learnable by new players with Lynn’s careful note-by-note instruction. No Tab.